PP. 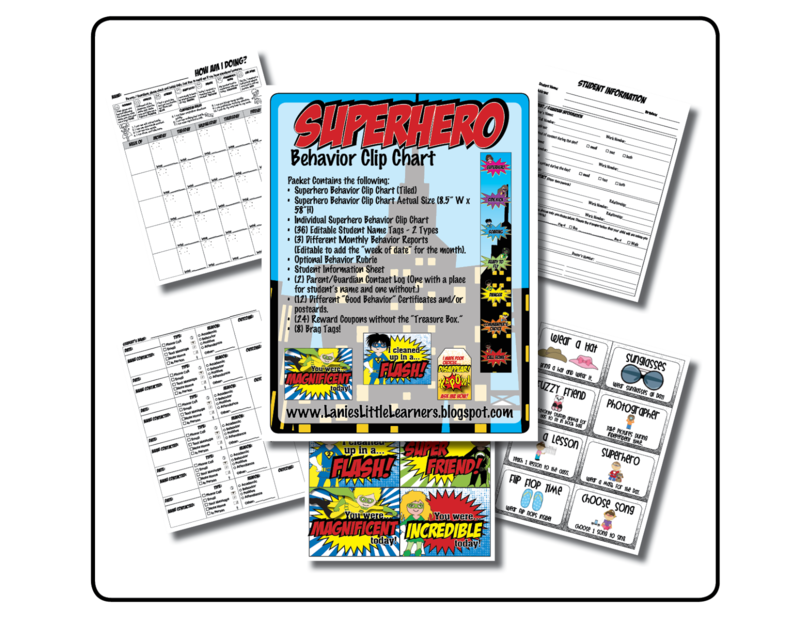 9 Individual Superhero Behavior Clip Chart: Instead of making a public display of student’s behavior, use the Individual Superhero Behavior Clip Chart. The charts can be placed in the student’s desk, cubby, in a folder, basically anywhere that is out of sight. Simply print on card stock, cut out, and laminates for durability. PP. 13 How Am I Doing? 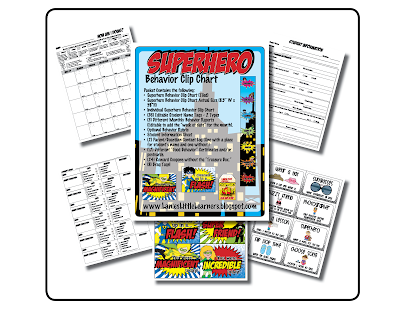 Monthly behavior report using color coded Superhero. Look at the top and decide which color the student received at the end of the day and color in the star burst. PP. 14 How Am I Doing? Monthly behavior report using number coded. Look at the top and decide which number the student received at the end of the day and write the number on the star burst. PP. 16 Student Information Sheet: I keep the student information sheet, parent / guardian contact log in 3-ring binder tabbed for each student. At the end of the month I place the monthly behavior report in there as well. PP. 26 Brag Tags: To use as a positive reinforcement for good behavior. Decide on how many points or how many days your student is on a certain level before receiving a brag tag. Print on card stock, laminate for durability, and cut out. Punch a hole at the top and use ribbon to make a lanyard.